who cares if languages become extinct? UNESCO reports that 2,500 languages are threatened with extinction. As reported, it is easy to have an immediate reaction of horror as the word extinction evokes a loss of a living species. In fact “languages are undergoing a global extinction crisis that greatly exceeds the pace of species extinction,” said David Harrison, a linguistics professor at Pennsylvania’s Swarthmore College (via nationalgeographic.com). However, some people hear this news and wonder “Is language extinction a good thing?” After all, wouldn’t it be easier if we could all communicate using the same language? isn’t language extinction just part of language evolution? In addition to being natural, it helps communication. Shouldn’t we do everything we can to hasten this trend in the name of world peace? Actually, it’s not exactly natural for people in diverse ecosystems to speak identical languages. We have different things to describe based on location and specialization, it makes sense that we would have different words, even different grammar, to describe our uniqueness. And it’s true, I could take a word like, “ederre” in their language, which means a 4-year old, male, un-castrated, domesticated, ride-able reindeer. And I can express that concept in English. I just did. But, languages are the product of millennia of fine-grained and sophisticated observation and packaging of information into hierarchies and taxonomies. Any of you that have ever gotten a million hits for your Google search and have been frustrated by that result, understand the value of structured information, of folksonomies. These languages are like trees. They organize information. 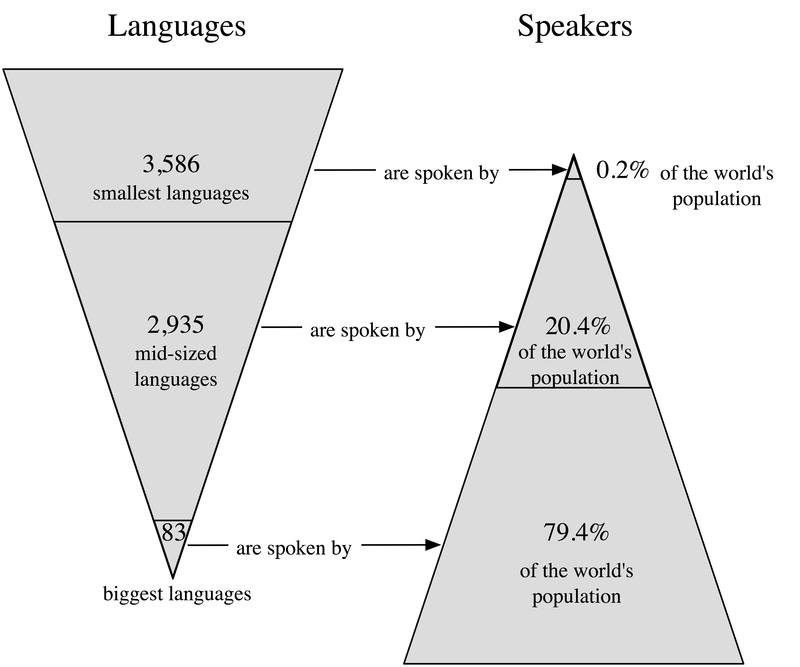 When people shift over to speaking global languages, it all gets flattened out into a puddle. Harrison also makes the argument that preserving these languages is related to preserving species and ecosystems. He describes the language of the Yupik of Alaska as a “technology” which aids them in hunting and in surviving in one of the harshest environments. Perhaps their ability to name, and thereby precisely distinguish 99 different formations of sea ice is also one of the most sensitive instruments to detect the signs of climate change and global warming. Maybe Western scientists should spend less time “discovering” and more time listening and collaborating with people who have these specialized skills encoded in their language. In Bolivia, Harrison and Anderson met with Kallawaya people, who have been traditional herbalists since the time of the Inca Empire. In daily life the Kallawaya use the more common Quechua language. But they also maintain a secret language to encode information about thousands of medicinal plants, some previously unknown to science, that the Kallawayas use as remedies. The navigational skills of peoples in Micronesia, meanwhile, are similarly encoded in small, vulnerable languages, Harrison said.